Prices & shipping are for orders to the continental United States only. We do not ship internationally. Not your grandmother's pincushion - a rainbow colored tomato topped with an emery strawberry! 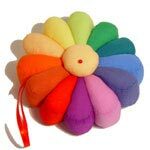 Not your grandmother's pincushion - a rainbow colored Dresden Plate with an emery center! 100 slender, flat head pins in a cute, 2"x3" collector's tin. These would make a great Secret Sister gift! Not into making hanging sleeves? Need one (like yesterday) for that guild show? Don't like the way your sleeve makes your quilt curl over the top of the rod? Here's your answer! A pre-made 108" quilt show regulation, pleated sleeve that allows your quilt to lie perfectly flat at the top. Just cut it to the width you need and stitch it on according to the included directions. Quick, easy, and affordable! 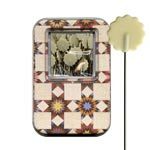 Longarm Quilters: Pin this temporarily to a customer's quilt to easily display it for photo-taking or customer pick-up. 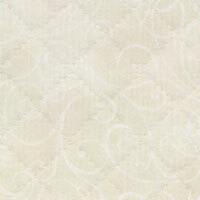 100% cotton muslin. 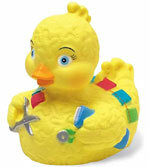 Just what you've always wanted: an adorable Rubber Duckie with her own quilting supplies! Brought to you by quilter and Duckie collector, Jodie Davis, this quilting Duckie would be the perfect gift for a quilter's baby or grandbaby! 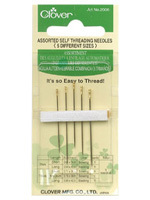 A great little must-have tool for cleaning out the feed dogs or bobbin area in your domestic sewing machine. 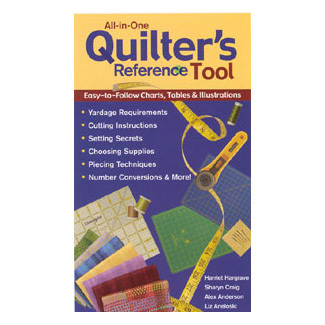 Great, too, for longarm quilters! Allow us to choose the brush color for you. If multiples are ordered, a selection of colors will be included. by Harriet Hargrave, Sharyn Craig, Alex Anderson, and Liz Aneloski Easy-To-Follow Charts, Tables and Illustrations, Yardage Requirements, Cutting Instructions, Setting Secrets, Piecing Techniques, Number Conversions and more! − Store your fabric folded at the 11-inch width—it is ready to cut when you are ready to Quilt! 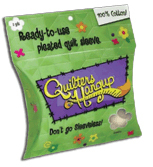 Longarm Quilters: The easy way to bury your threads! Even if you have short thread tails, just insert the needle in the last stitch, pop the tail into the slit in the eye, and pull the needle through. Fast, neat, and easy!